Even Slight Driving Distractions Can Be Catastrophic - Ayers, Smithdeal, & Bettis, P.C. Recently, a fatal accident in South Carolina demonstrated just how dangerous any type of distraction can be when you are behind the wheel of a car, truck, or another type of motor vehicle. A truck driver was operating an 18-wheeler with a trailer filled with huge logging materials when, according to reports, he briefly crossed over into another lane. When the driver over-corrected, he lost control and the truck tipped over, spilling giant logs into the roadway. Another driver in a pickup crashed straight into the logs and did not survive the impact or the fire that resulted. Due to the statements given and the nature of the accident, Highway Patrol officers believed the large truck driver had momentarily taken his eyes off the road. Government statistics indicate that an estimated 424,000 individuals were injured in the U.S. due to distracted driving in a single year. When most people think of distracted driving these days, they tend to think of texting, looking at social media, or otherwise using a cell or smartphone. While this is widely considered to be the most dangerous distracted driving epidemic in the U.S., you do not need to look at a phone to be distracted. Authorities in the above incident specifically stated they did not believe that the truck driver was texting or using a phone. Instead, they reported that he simply looked away from the roadway for a matter of seconds. Any other activity that briefly takes your eyes from the road, your hands from the wheel, or your focus off of driving. When drivers make the decision to engage in distractions while driving and they cause injuries or fatalities, they should be held responsible for their negligent actions. 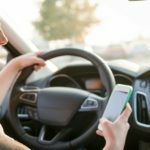 Victims of distracted driving accident or surviving family members can seek compensation from the distracted driver by filing a claim with the at-fault driver’s insurance company or a claim for personal injury in the South Carolina courts. If you or a loved one has suffered injuries in an accident and you believe a distracted driver may be at fault, you should not hesitate to call a Greenwood, SC car accident attorney at the law firm of Ayers, Smithdeal & Bettis, P.C. as soon as possible. Proving distracted driving can be challenging, though we have the experience and resources to investigate your crash and gather evidence of the distracted driver’s negligence so that you can recover for your losses. Please call us today at 855-213-4405 to schedule a time discuss your case for free.